DENVER – In the 10 years since the recession and housing crisis, home prices have steadily risen in Denver and the surrounding areas, making it increasingly difficult to find an affordable home. Citywide, the average sale price of a detached single-family home has climbed nearly 60 percent since 2007, standing now at slightly more than $426,000. Some parts of the metro area, however, have seen much steeper increases approaching 200 percent. 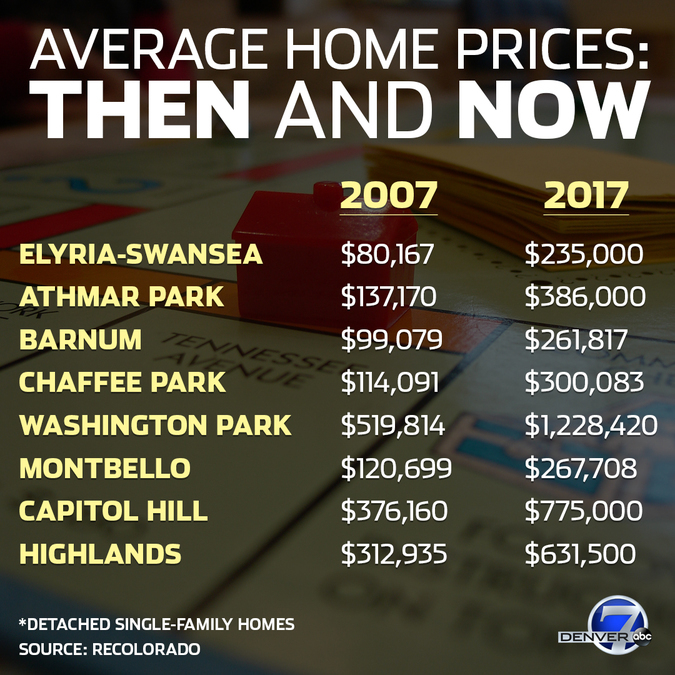 At the neighborhood level, numbers from the Denver Metro Association of Realtors show the biggest changes occurring in areas where you used to be able to get a home for $100,000 or less. In Elyria-Swansea, for example, the average price of a single-family home in 2007 was just more than $80,000. Now, you’re looking at an average of $235,000, which represents an increase of about 193 percent. It’s a similar story in Athmar Park, where the average home price has jumped 181 percent in the past decade to $386,000. In the Barnum neighborhood, where you could once get a home for just over $99,000 10 years ago, you’ll now have to pay more than $260,000. Though neighborhoods within Denver city limits have seen some of the most dramatic increases in home prices, other cities within the metro area are seeing the same trend. In the portion of Aurora that falls in Adams County, prices have increased 113 percent since 2007. Commerce City is up 82 percent in the past decade and Northglenn is seeing average prices up almost 64 percent. The map below shows average prices in 2007 and 2017 for a selection of counties, cities and individual neighborhoods within the Denver metro area. Open the menu by clicking the button in the top left and click on each layer to toggle between them. Where can I find a home in the $250,000 range? For the most part, if you're looking for a home that costs about $250,000, you'll have to look outside of the Denver city limits. The good news is that you don't have to go that far, according to Steve Danyliw with the Denver Metro Association of Realtors. "The most affordable neighborhoods are the north area of Aurora, Westminster, even south Aurora as far as Adams County or Arapahoe County," Danyliw said. Realtors say buyers in those areas can expect to find two or three bedrooms but it will most likely be an older property and it might not be your ideal choice of neighborhood. Not only is Denver expensive, but it’s a fast-moving market, with many homes entering and leaving the market in a matter of days. In fact, a recent report from real estate brokerage Redfin named Denver the fastest market in the country . Diane White knows that first-hand. She just bought a home in Denver’s Five Points neighborhood, making an offer within 24 hours. “If you find something you like, you better move fast or it’s going to be gone,” White said. One of the main reasons homes are selling so quickly is low inventory – there simply aren’t enough homes available to meet the increasing demand. RELATED: In Denver's tight housing market, does it make more sense to rent or buy? That low inventory makes for intense competition and real estate agents say buyers have to move quickly and bring something extra to the table to beat out other bidders. Some prospective buyers write letters to sellers, while others even create videos to showcase their families. The housing hype might have people worried that we’ll be seeing a housing bubble burst in the next couple years, but Danyliw said that’s not likely. “None of the things that we’ve been tracking indicate any type of housing bubble,” Danyliw said.